At the request of a Forum member, this post looks at the long-term history of U.S. dividends plus net share buybacks — i.e., the Total Payout Yield of cash returned to U.S. stock investors since 1871. The first chart below shows the variation in the Total Payout Yield, around a long term average of 4.7%. Looking closely, one can detect a gradual downward trend over the past 75 years. The Forum member was interested if Total Payout Yield = Equity Risk Premium (per this article by William Bernstein), but the correlation proved weak in both the short and long term. The second chart shows a breakdown of dividend and net buyback yields for the S&P 500 since 1980 (when buybacks first became a significant factor in returns). Again, there's been considerable variation, around an average of 4.0% total. For those investors disappointed by the low dividend yields of recent years, take heart! Due to strong share repurchases, U.S. corporations are returning nearly the same overall percentage of cash to shareholders as they always have. Last edited by SimpleGift on Wed Jul 04, 2018 7:53 am, edited 1 time in total. I thought they were interesting. 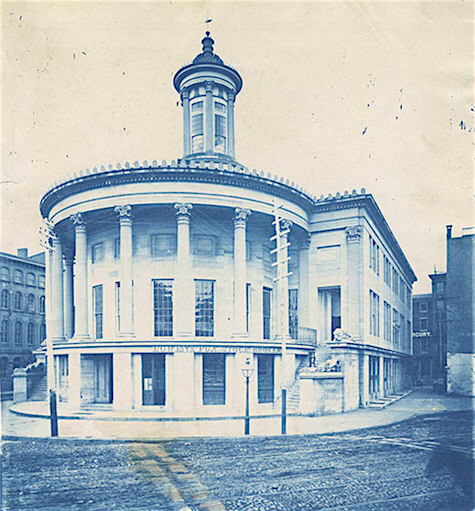 (the oldest stock exchange in the U.S., founded in 1790 as the Board of Brokers). As I understand it, there was no such thing as "the U.S. stock market" prior to about 1900. There were just these regional stock exchanges in the major cities around the country that traded regional stocks — most of which were local banks and railroad companies early on. Last edited by SimpleGift on Tue Jul 03, 2018 10:47 pm, edited 1 time in total. No, buybacks and dividends are two ways that cash is returned to investors. They do not "increase shareholder returns". Thanks SimpleGift for a great post! It's very insightful. Unfortunately, some here seem to believe that buybacks are not beneficial to shareholders. Yes and no. IIRC local exchanges were a thing for much longer than that, serving local small cap companies. The San Francisco one hung on until 2000. However, the NYSE was always the biggest and most dominate exchange in the US. Thanks very much, Todd. I'd always been fascinated by Bill Bernstein's suggestion long ago in the Efficient Frontier column you linked to that a shorthand way to find the equity premium was to simply use the corporate dividend rate. Your charts showed at best only a slight correlation. It's intriguing to study investor's reactions to dividends. Graham suggested stocks would do poorly after 1958 when bond yields passed stock yields for the first time since the depression. He was wrong, of course. Floyd Norris, once of Barrons, then the NYT business section (now retired) had a large following for his 4% rule: when the S&P 500 yield falls below that level, cut back on stocks. Your charts above show that the cash return to shareholders has actually remained pretty steady at 4%; just the method of return has changed. In all likelihood corporations have simply reacted to what they think shareholders want;or, in the past few decades, they have used a bit of sleight of hand thru buybacks to argue the best way to stimulate their options payouts and return cash to shareholders is to do a buyback. They tend to get done most aggressively at market peaks, that being when cash/or borrowings are easiest to access. I think the concern with buybacks is the significant number of companies that issued debt when interest rates were lower to fund buybacks. Such activity is not returning cash to shareholders, but rather is increasing leverage and debt-to-equity ratios. Such activity may not be a sustainable shareholder benefit. Newbie here. Fascinating post. I can see why the average index fund investor likes dividends. However, I am not sure I understand why share buybacks would benefit those investing in index funds. Is it basically a supply and demand issue? In other words, as companies buy back shares, the overall number of shares in circulation is decreased, so the price for the remaining shares will rise? If so, has there been any research showing on a dollars per share basis how much a stock is expected to rise when a company buys back shares? Given all of the many factors involved, I would tend to think that shareholders would benefit less from a share buyback than from dividend payments, but I could be wrong. Shifting risk from equity to debt most certainly does benefit shareholders. Robbing Peter to pay Paul is not such a bad deal if you're Paul. If a company is doing buybacks when that isn't the best use of capital it is a problem, but that is a completely independent issue from where the buyback cash comes from. Don't conflate what are two different ideas. FWIW, one of the main reasons that stocks with high dividends do so poorly in rising rate environments is that companies depend on debt issuance to support their dividend payments. When rates rise, they can't afford to keep up that practice and investors know it. It's been studied: $1 in dividends benefits shareholders pretty much exactly as much as a $1 spent on repurchasing shares. I'd love to read more on that. Could you provide any links to that research? That would suggest that after tax returns are the same regardless of if that 4% is returned as dividends or as share buy backs. I disagree with this. Typically dividend taxation occurs in earning years where you're not in a 0% dividend tax bracket. In a draw down phase previous higher earners can actually be in the 0% CG bracket based on which buckets they draw from. Also, if we're talking about returns for the estate, where say the taxable account isn't necessary in retirement but where it will be passed to heirs, you've paid dividend tax along the way in the dividend model (lowering your returns) whereas if it was all buy-backs your account would get a step up in basis and you will have paid nothing in tax along the way (this higher returns). Just to note that U.S. stock repurchases are projected to be in record territory in 2018 — over $800 billion — due to the recent corporate tax cut, plus companies' new ability to bring back overseas cash (chart below). So far in 2018, this buyback boom appears heavily tilted toward tech companies and growth stocks ($280 billion), compared with value stocks ($90 billion) — so momentum and growth are likely to continue to benefit, as well as the overall market. Last edited by SimpleGift on Wed Jul 04, 2018 9:36 am, edited 2 times in total. That would suggest that after tax returns are the same regardless of if that 4% is returned as dividends or as share buy backs. Not every investor has the same tax structure that you have. Many investors pay no income tax at all. Complementing the previous findings, we also report that the market reaction surrounding the announcement of dividend decreases is significantly less negative for repurchasing firms than for nonrepurchasing firms. We find that the market reaction to dividend decreases is not significantly different from zero for repurchasing firms, and that it is significantly negative for nonrepurchasing firms. These results further support the idea that share repurchases and dividends are close substitutes. However, I am not sure I understand why share buybacks would benefit those investing in index funds. It is "Cash Flow to Equity". At a high level it does not matter how the cash is returned. At a lower level, taxes and other factors come into play. Modigliani–Miller Theorem is the classic text, written in the 1950s, in every text book, and won a Nobel. From a practical viewpoint, the index fund would sell a portion of their holdings in that stock and reinvest it in the index. The selling is sometimes called a "Manufactured Dividend" because the cash flows for both the investor and corporation are equivalent to that of paying a dividend. Ignoring taxes, transaction costs, etc. Of course, companies borrow to pay dividends as well. And paying dividends does increase leverage. Let us look at this from the other side - What is the correct level of leverage for a firm? O.k. - this is going to vary from industry to industry, from one economic structure to another. However, let us assume that the CFO can figure out the right leverage ratio. After they do that, does it matter if they get to that leverage ratio organically over years or immediately by issuing debt and/or doing a share buy-back? I say that if you know what the correct leverage is, move to that leverage immediately. There's been a number of papers in recent years focusing on the Total Payout Yield (dividends plus net share buybacks) as a much superior measure of total return to shareholders, replacing the historical focus on just dividend yields. But with all this new attention on total payouts, it's puzzling why it's still so difficult to obtain net share buyback data on today's market indexes. 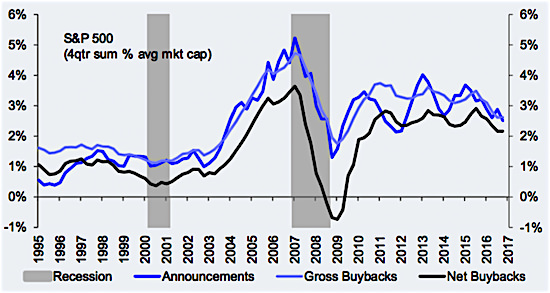 Several sources, including S&P, regularly publish gross buyback yields — but these are meaningless unless adjusted for new share issuance, to produce net buyback yields. It seems index providers are falling short on this front. I'm not making assumptions based on my situation. My examples were meant to be illustrative. At best you have an equivalent structure. But anything worse than that would tend to favor share buy backs. Any basic corporate finance textbook under "Modigliani Miller theorems". Brealey and Myers Principles of Corporate Finance will do. An older cheaper edition. There is also "Corporate Finance for Dummies" and those are usually pretty good places to start. Relevant introductory course from "The Great Courses". Also probably Robert Shillers course on Coursera (Yale University Financial Markets). Might be some free stuff on YouTube Google Modigliani Miller. 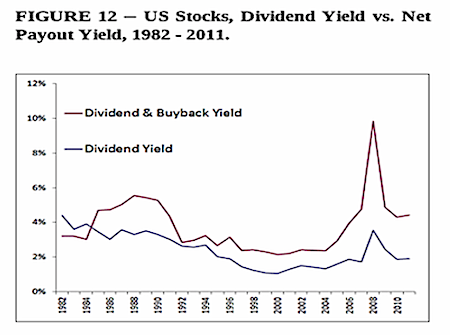 Buybacks defer taxes as compared to dividends. Maybe a more important reason buybacks are so popular is that CEO pay is frequently tied to stock price. It's an easy choice for a CEO to make, higher bonus or not? My now vague memory from a Finance class in college (1980-ish, and I didn't always show up) was that dividends were THE WAY to drive stock prices for companies. That assumption would play out with today's retirees expecting large dividends and continuing to buy dividend stocks. Clearly, things change over time -- and investors must adapt to that change. Very true. Thanks for the Deutsche Asset Management link. Call me dumb, but I can't find how you extracted the 1980+ net buyback annual yields from this document, though? Please clarify? Maybe.l Most boards are smart enough so they adjust for such things nowadays. It has been generalized into "Free Cash Flow to Equity". Not sure when the shift happened, but I would guess it would be in the 90s when more and more companies just never issued any dividends. That being said, dividends are easy to comprehend and easy to model which is why they make it into the introductory courses. It turns out to be true more recently that ANNOUNCING a stock buyback tends to lead to price appreciation. In part because of the theoretical improvement in EPS and in part because of the signaling effect (i.e. the idea that a company is announcing, effectively, that it thinks its stock is "cheap"). And there is never a need to announce the END of a stock repurchase plan or even the failure to complete such a plan. Announcing a new dividend program or an increase in dividends doesn't generally provide much discernible lift to stocks, but announcing a CUT in dividends generally precedes weak stock returns for all the reasons you might imagine. As a result of this asymmetry, buybacks may be preferred because they don't "commit" the company to repeating the action in the future in the same way that raising a dividend implicitly does. Plus, announcing a stock buyback doesn't even commit a company to actually completing the buyback: monitoring the amount of net share repurchases is generally a bit difficult. On the other hand, announcing a dividend increase that never actually gets paid would be immediately and widely noted. Last I looked at this, about 2003, it was abundantly clear that dividend increases had a stronger signalling content than announcements of buybacks. A more credible signal and thus a greater positive impact on stock prices. Hence various "dividend achiever s " funds. 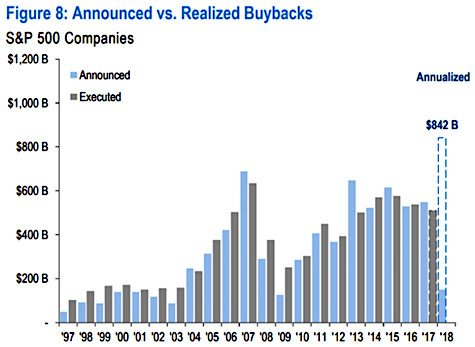 Buybacks are, of course, better for stock option holders. Thus when msft began to pay a dividend it switched to Restricted Stock Units for exec compensation (also stock options were to be expensed under US GAAP which made them more "expensive" in EPS terms). Thanks for the Deutsche Asset Management link. Call me dumb, but I can't find how you extracted the 1980+ net buyback annual yields from this document, though? Please clarify? Apologies for the confusion. As I've posted on this topic before, I already had S&P 500 net buyback yields in a spreadsheet for 1980-2012. The Deutsche chart data (in black below) was just used to update my spreadsheet for the 2012-2017 period. Though net buyback yields do vary a bit from publication to publication (if one can find them at all! ), the Deutsche data above tracked closely with the pre-2012 numbers already in the spreadsheet — i.e., happily, there was good agreement. As I've posted on this topic before, I already had S&P 500 net buyback yields in a spreadsheet for 1980-2012. Ok, got it. Could you please remind me where you found the 1980-2012 S&P 500 net buyback yields, then? I noticed today that Ed Yardeni is calculating the current total investor yield of the S&P 500 at 4.45%, consisting of 1.89% div. yield and 2.56% buybacks. If I'm not mistaken, Yardeni is showing gross share buyback yields not net — which is frustrating since it doesn't account for new share issuance. Notice the difference between Yardeni's past yields and the Deutsche net yields just upthread (in black). Could you please remind me where you found the 1980-2012 S&P 500 net buyback yields, then? The difference between the red line (net payout yield) and the blue line (dividend yield) is the net buyback yield. I'll keep looking to see if I can come with a more solid data source than this for the pre-1995 period. I think you're right re Yardeni and gross yields. I don't see an explanation in this document, but he is depending on S&P published data, which is the gross yield.